The Lone Drainer And Pronto, Happy Customers! We have an exceptionally large “Hills Weeping Fig” tree in our street right outside my home and this has caused many problems to the sewer of both ours and all the surrounding houses. The roots of this tree have gone under the house and into the sewer pipes…They are very aggressive. I highly recommend Dave and the Lone Drainer and Pronto team as they always returned telephone calls promptly, arrived for pre-arranged site visits on time, conducted a number of site visits to ensure the best possible solution to a tricky problem hot water supply and when agreement was made for the works to be carried out he arranged to do so without delay. ..Both yourself and Tim (along with the rest of your team) have been a great help with our bathroom renovations. My wife and I really appreciated your ever prompt service! Thanks for letting me pick your brains so many times. Thank you again for all your assistance (at all hours-weekends and whenever was required) over the past 10 years. You have dealt with some very difficult plumbing problems and always found a solution, without fuss and fanfare. This has been greatly appreciated. Taking time to educate our owners and tenants has also ensured that we remain proactive in our approach to best managing our clients properties and the time you have spent on this side of business is of immense value and again greatly appreciated. Thank you David, I look forward to our continuing association and friendship. ……and selected The Lone Drainer and Pronto from 3 quotes. Their price was competitive, they provided a detailed breakdown of the intended work and I liked their friendly manner. The job was completed to my satisfaction, on time and on budget. Chris and Paul, who did the job, were very professional and came up with good ideas on how to Improve on the design. Whenever we agreed on additional work they quoted first so I always knew where I stood. I would have no in hesitation in recommending them for similar work. Thank you for fixing the drains. Always an excellent service and I like your reminder/recall each year. I am always grateful when people call when they are running late as you did. 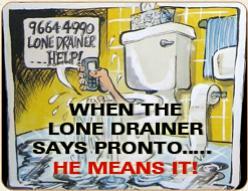 The M… family wish to thank The Lone Drainer & Pronto very much for the replacement of our Hot Water Unit. Cold showers in the middle of winter were not seen as a great option by some in the family. The speed at which Leigh and Chris arranged for a replacement unit was fabulous, but to arrive to install it ten minutes after it arrived was excellent. Their workmanship was first class, thorough, efficient, tidy and safe and very cooperative. We cannot recommend your services highly enough.